This is an experimental research and development project by formerly Google X. This project is to provide internet access to rural and remote areas. This project uses high-altitude balloons placed in the stratosphere at about 18 Km above sea level. Two of these balloons have been spotted on an app called "FlightRadar24. (which please Google). 13.5493. The track is 104 degrees slightly south of due east. If it continues on it's current track it will pass very close to Cape Town. It might be possible to bounce VHF or UHF signals off the Mylar balloon material. There is another balloon which is presently over southern Angola. It's registration is N183LB. 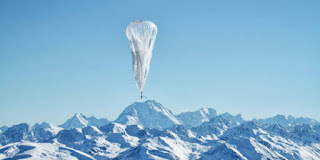 Check out Project Loon on Google and [here and here], and also FlightRadar24 [here].